When I went back to the airport to depart for Barbados, I came to the painful realization that all the efforts to get the Mooney washed in Abidjan had been for naught. Once again, N60RP was dust covered, sand laden, and downright frumpy. Cape Verde's constant winds had even blown dust and corrosive sand up under my firmly attached canvas cabin cover, soiling all the windows underneath. I was very glad that I had remembered to place a cover over the pitot tube, as the cover was literally caked with a film of dust that would otherwise have invaded my pitot static system and possibly damaged the sensitive airspeed indicator. I did get some consolation from watching the ramp crew prepare a Boeing 757 for its first flight of the day. That plane, too, had spent two days on Sal's wind swept ramp, and it took a crew of a half dozen workers several hours to wipe it down for the day's upcoming flight to Lisbon using ladders and long handled dust mops. In addition to wind and sand, Sal had something else in common with Walvis Bay. Takeoff from there was a piece of cake. With headwinds of almost 30 kts coming right down the runway, the high daytime temperature didn't much matter in my takeoff roll. Although I had filled all my tanks to the maximum level (the first time I'd done that since flying from Hawaii to Western Samoa) I was airborne in less than 2,500 ft! A quick left turn toward the Atlantic Ocean, and I was off for what would be my last "full fuel" leg of the trip. Best of all, I was headed back into my home hemisphere after a month and a half on the other side of the world! Although the 14 hour flight was one of my longest, it was mostly smooth, and uneventful. In fact, I had lots of time to fire up the HF radio on the 20 meter amateur radio band and made 28 contacts in seven countries. The most gratifying of these was a chat with a fellow who had a small HF radio similar to mine mounted in his car. He was driving on the freeway through North Carolina on his way to Vero Beach, Florida. With small antennas and low power transmitters, we were still able to talk from car to airplane at a distance of more than 3,000 miles apart. Neat! 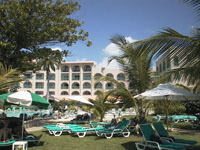 My hotel in Barbados, the last foreign stop before returning to the USA via Puerto Rico. 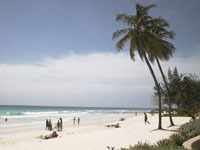 The lovely beach behind my Barbados hotel. It's a tough job, but someone's got to do it! 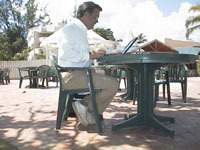 Here I am, soaking up some sun on the poolside deck behind my hotel in Barbados, writing this trip report for you.